I guess I’m on a plate tectonics kick … the last few Sea-Floor Sundays have shown bathymetric (sea-floor topography) images at a scale where big-scale tectonic features are evident (see Scotia Plate, regional context of Chaitén volcano, and Gulf of California). 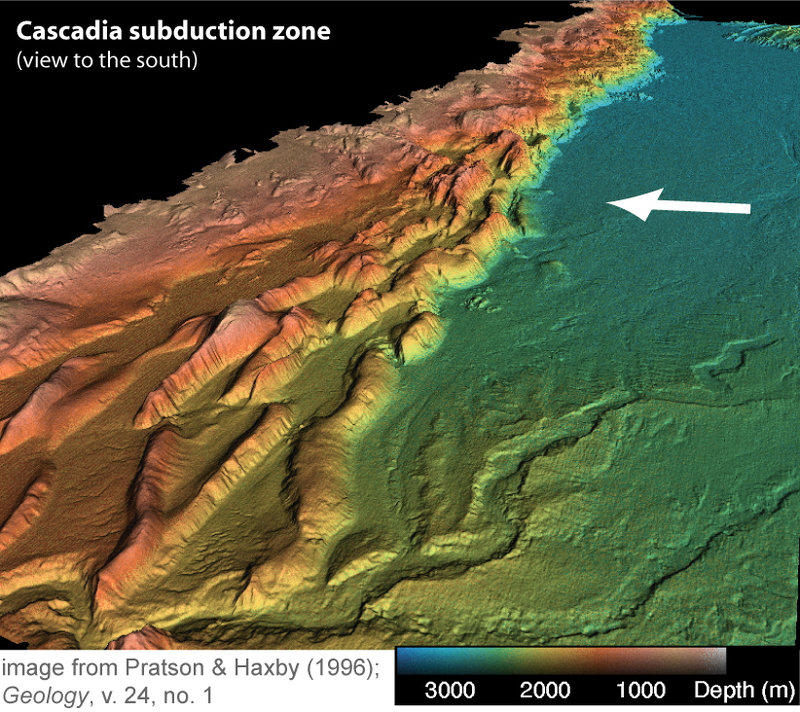 For today, I wanted to show a nice image of the Cascadia subduction zone offshore of the Pacific Northwest of the United States. 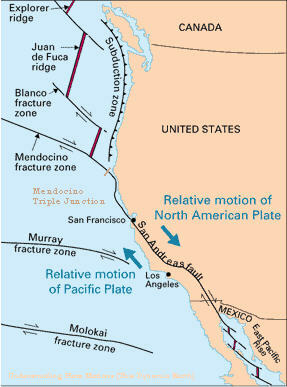 First, the map (below) shows the relatively small Juan de Fuca plate and associated subduction zone for context. The Juan de Fuca plate is subducting from west to east under northwestern United States and southwestern Canada. As sea-floor mapping technology continues to improve researchers continue to learn more about submarine geology. As the resolution and coverage gets better we are able to investigate regions across a broad range of scales. Coastal areas are mapped much more thoroughly than the open ocean because of their importance to human livelihood (and proximity for operations). As a result, many of Earth’s continental-oceanic plate boundaries are relatively well-imaged. The image below is from a paper I’ve discussed before by Pratson & Haxby in 1996 (link to paper here). This only shows bathymetry seaward of the continental shelf edge – all the black area in the upper left is the submerged continental shelf and coastline. The view is to the south and shows the Oregon part of the subduction zone. The first thing that jumps out in this image is the belt of folds and faults that runs the length of the subduction zone in this area. This is mostly sedimentary material that is getting crumpled up as the plate subducts (from right to left on image above). As accretionary wedges go, this one is pretty dang accretionary! In fact, you can’t even see an obvious trench seaward of the fold-thrust belt. This area is so swamped with terrigenous sediment (i.e., derived from continent) that its filling in any low spot it can get to. Note the relatively flat areas between the worm-like ridges – these are basins filling with sediment. One reason why ancient accretionary wedges are so difficult to figure out is that sedimentation and deformation are occuring at the same time, which results in mind-bendingly-complex relationships. Also note the beautiful submarine valley heading out seaward of the continental slope onto the less-deformed oceanic plate. Even though you can’t quite see it (off the bottom left of the image), you can imagine that a sediment pathway has developed cutting through the entire accretionary wedge. That’s a fun story to save for another time. I’m enjoying the plate-tectonic kick – and your diagram and sea-floor view above are particularly great!